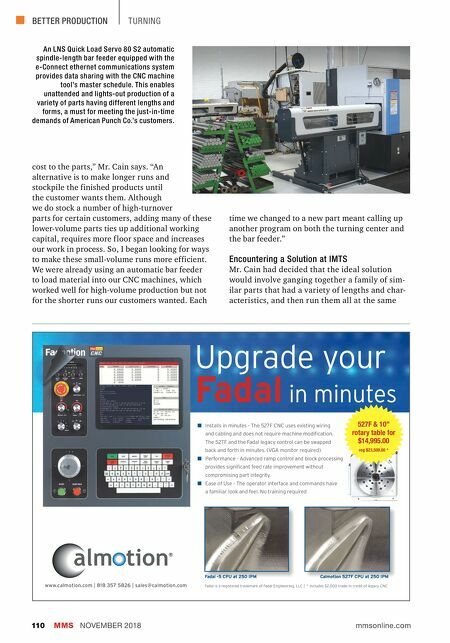 BETTER PRODUCTION MMS NOVEMBER 2018 110 mmsonline.com TURNING cost to the parts," Mr. Cain says. "An alternative is to make longer runs and stockpile the finished products until the customer wants them. Although we do stock a number of high-turnover parts for certain customers, adding many of these lower-volume parts ties up additional working capital, requires more f loor space and increases our work in process. So, I began looking for ways to make these small-volume runs more efficient. 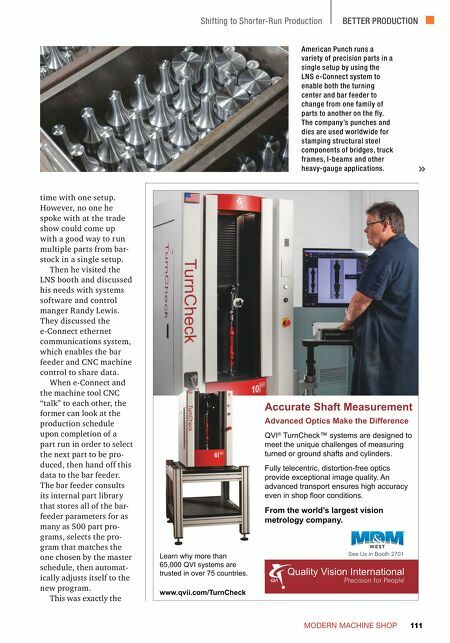 We were already using an automatic bar feeder to load material into our CNC machines, which worked well for high-volume production but not for the shorter runs our customers wanted. Each time we changed to a new part meant calling up another program on both the turning center and the bar feeder." Encountering a Solution at IMTS Mr. Cain had decided that the ideal solution would involve ganging together a family of sim- ilar parts that had a variety of lengths and char- acteristics, and then run them all at the same Upgrade your Fadal in minutes n Installs in minutes - The 527F CNC uses existing wiring and cabling and does not require machine modification. The 527F and the Fadal legacy control can be swapped back and forth in minutes. (VGA monitor required) n Performance - Advanced ramp control and block processing provides significant feed rate improvement without compromising part integrity. n Ease of Use - The operator interface and commands have a familiar look and feel. No training required www.calmotion.com | 818 357 5826 | sales@calmotion.com Fadal is a registered trademark of Fadal Engineering, LLC | * Includes $2,000 trade-in credit of legacy CNC ® Fadal -5 CPU at 250 IPM Calmotion 527F CPU at 250 IPM 527F & 10" rotary table for $14,995.00 reg $23,500.00 * An LNS Quick Load Servo 80 S2 automatic spindle-length bar feeder equipped with the e-Connect ethernet communications system provides data sharing with the CNC machine tool's master schedule. This enables unattended and lights-out production of a variety of parts having different lengths and forms, a must for meeting the just-in-time demands of American Punch Co.'s customers.